Prosperous 2012 to everyone! =) Hope you too will become gold capped this year - if you aren't already! The previously posted Recipe: Ghost Dye trick requires lots of Ghost Mushrooms if you want to learn the recipe and sell some Ghost Dye instead. Or alternatively you might want to become a shroom vendor and start selling one of the most rare herbs in the game! Cataclysm changed the zones entirely and Ghost Mushroom spawns in only a few zones. Where's the best place to farm it these days? Like previously, ghost shrooms liked to spawn in underground areas, like caves. According to wowhead, it spawns only in 2 very small locations currently. These are located in Zangarmarsh and Un'Goro Crater. There are other ways to obtain ghost shrooms also, such as purchasing them from the Darkmoon Faire vendor or farming appropriate level "forest" elementals, like Treants and Lashers. Still, one can obtain even 200 Ghost Mushrooms within 60 minutes if they choose herbalism instead! The best place to farm Ghost Mushrooms since Cataclysm is the famous gorilla cave Fungal Rock in Un'Goro Crater. There's about 10 nodes there waiting to be picked at all times. They also respawn relatively fast so you don't have to sit around and wait for respawns, at least if you have skinning also! 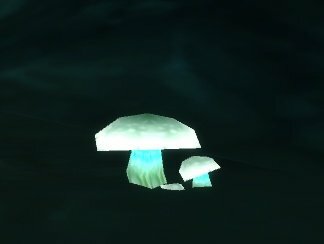 One Ghost Mushroom node contains 1-5 mushrooms, nothing more. Ghost Mushroom's value depends a lot on their availability. Usually there's only a couple for sale, so it's easy to buy them and list each shroom for say.. 5-10 gold! It's needed in small quantities, so one should sell them in stacks of 5-10 instead of 20. This makes the buyout price smaller so more people can afford it aswell. The cave is still full of level 50+ Gorillas. This means a skinner can make a fortune by selling leather from this cave. The leathers you obtain here are Rugged Leather and Thick Leather, both being the most valuable classic leathers usually.